Need a quick activity? 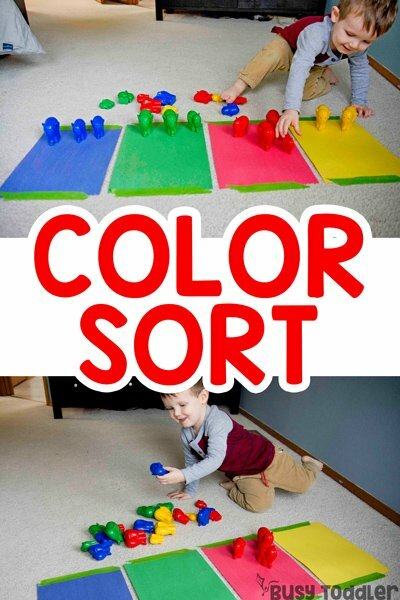 Try this color sorting activity! Activities do not need to be complicated. 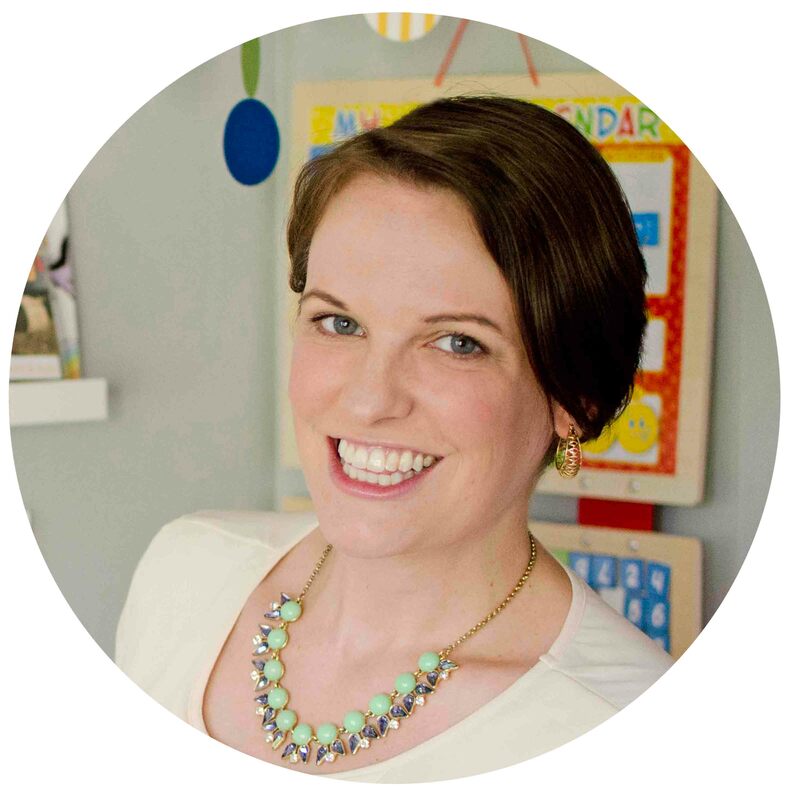 Whoever made up the rumor that you need extensive supplies and loads of prep time to make an activity awesome for toddlers was pulling the wool over our eyes! Toddler activities DO NOT need to cost an arm and a leg. 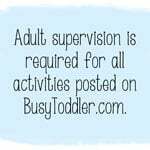 Toddler activities DO NOT need to be overly complicated. 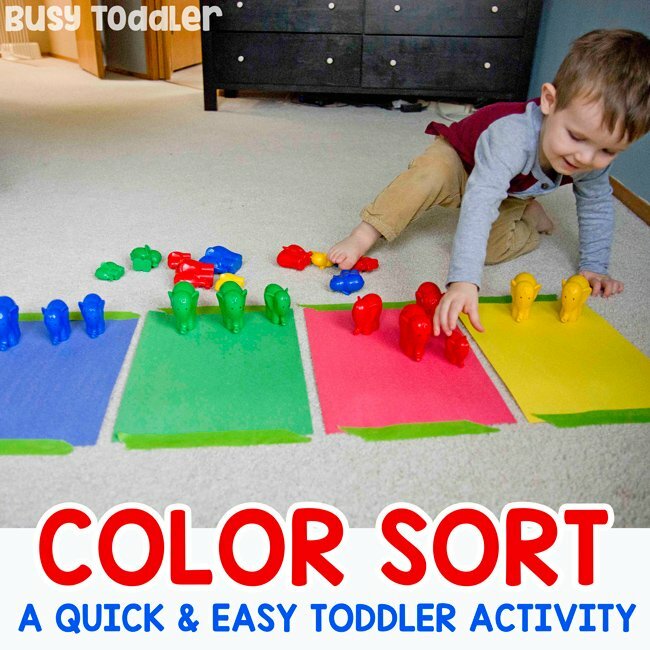 Toddler activities DO NOT need letters and numbers to be full of learning, and I’ll show you with this color sorting activity. RELATED: I love sorting so much, I made it a feature skill each week in Playing Preschool. 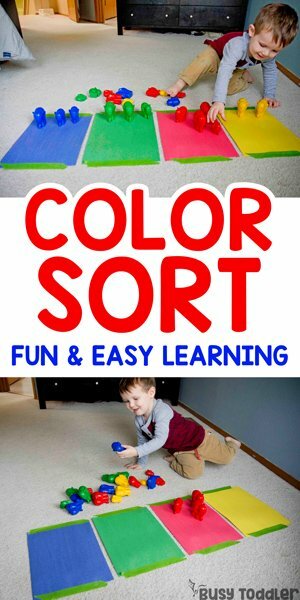 But is color sorting really a learning activity? 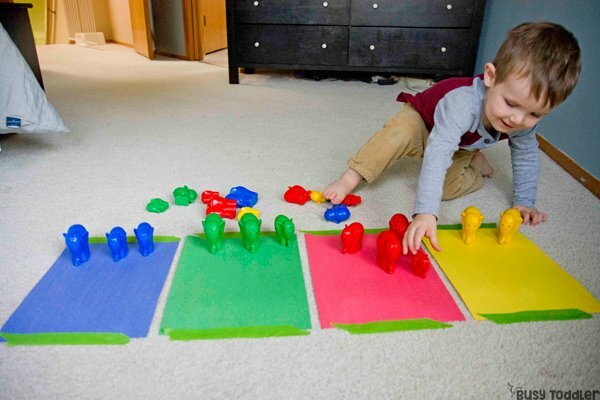 Sorting might look like a simple skill and it might look like a ho-hum skill (compared to the flashy excitement of a toddler learning their ABCs). But the reality is that sorting is a much more complicated skill than learning the alphabet. 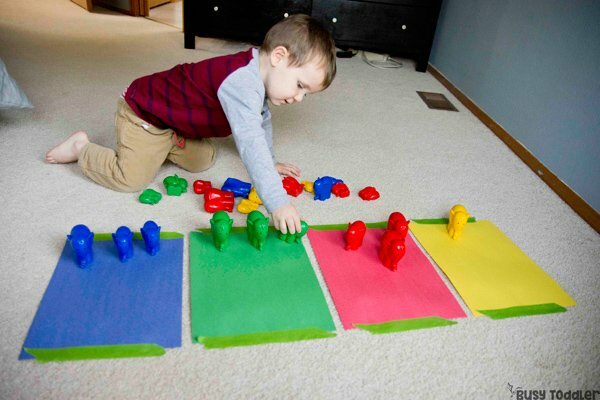 Sorting takes so much brain power for our toddlers – much more than memorizing letters. Really? Sorting is that big a deal? Let’s compare sorting to learning the ABCs. To learn the ABCs a child needs to memorize. That’s it. They need to be able to look at a symbol and tell you the name. WAAA-WAAAA. This is not that exciting. Now compare that to sorting: when a child is sorting they are analyzing information, describing attributes, comparing similarities and differences, organizing data, and really, really thinking critically about the objects they are working with. That’s a whole lot more than memorizing. We want children who can THINK. Not children who can memorize. 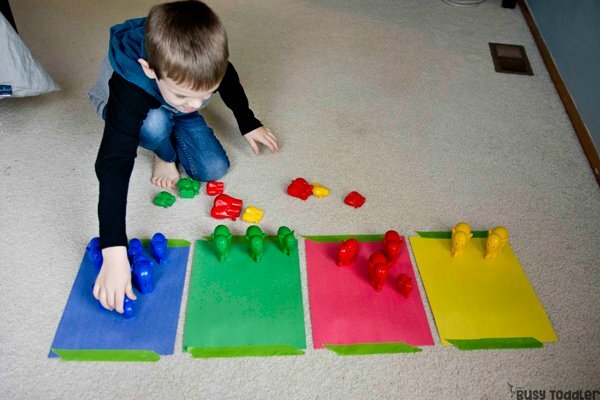 So let’s get their thinking going on with simple activities like color sorting. I taped the construction paper to the carpet to keep things from moving around on my 25 month old. Then I set down a few handfuls of his beloved elephants and asked him to sort. These are the words I used to explain this activity. He giggled as his brain started to fire up and consider all that he needed to do here. He’s only 25 months old so this is HARD WORK. Guess what? 5 year olds love this too! I caught my oldest playing this activity later! 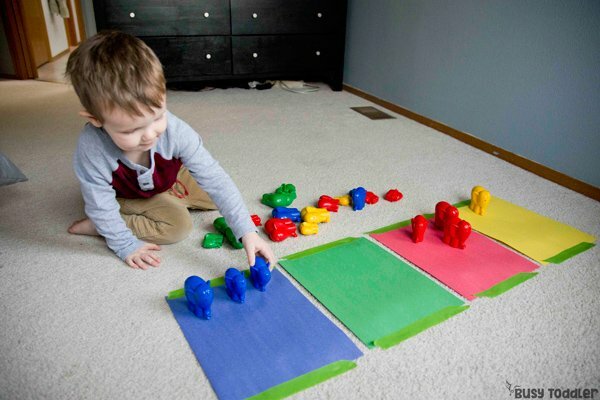 But he’s learning so much by color sorting! With every elephant grabbed, he had to think in his head, “What color is this?” Then he had to use his eyes to locate that color of paper. 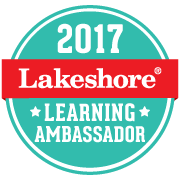 SO MUCH MORE THAN MEMORIZING! And remember: you don’t have to just sort with color. 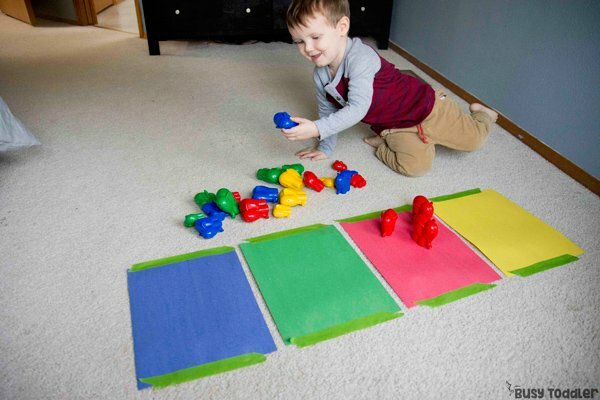 Color tends to be the first thing we ask children to sort by, but there are so many other ways. Think: size, shape, texture, smell, sound, type, etc. 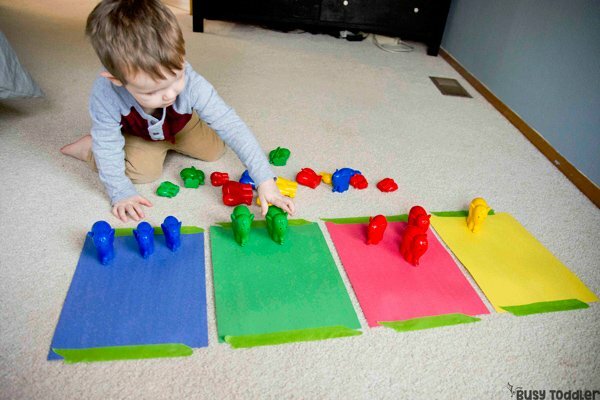 RELATED: Check out 8 of my favorite sorting activities! I love sorting and I love encouraging my kids to sort, because I know it’s encouraging them to think. 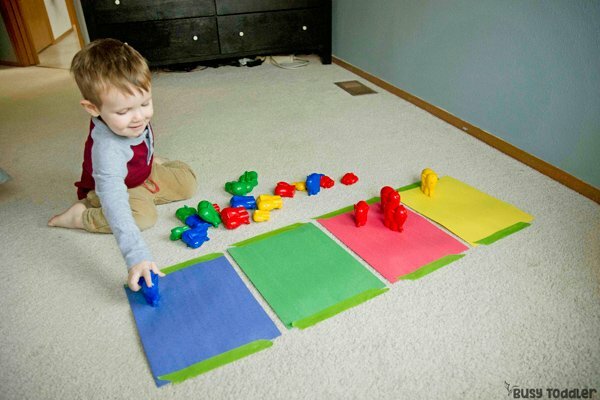 And the best part about sorting – it doesn’t cost anything to set up a quick sorting activity! 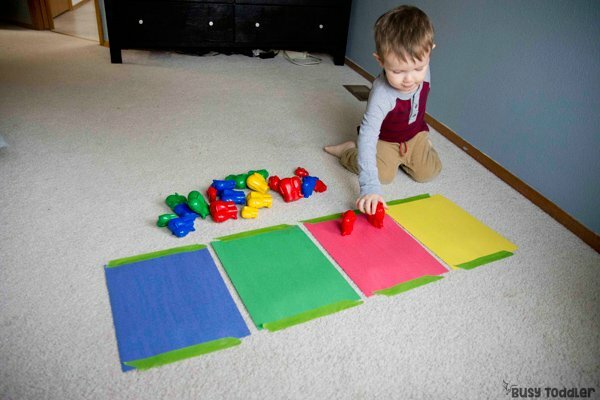 Will you do color sorting with your toddler?